(1) Nominees may be considered for induction by presentation from Committee Members, or by at-large nomination by the public. To be considered for the Knoch High School Sports Hall of Fame, an individual must have made a significant contribution to Knoch sports through athletic excellence and/or exemplary leadership contribution in sports activity. Applicants must be at least 30 years of age for consideration. The attached nomination form can be completed and submitted to the Athletic Office at Knoch High School. (2) Induction applications become the property of the Hall of Fame Committee. (3) Successful Inductees will be notified by mail and phone by the Athletic Director. (4) The Athletic Director will guide and provide direction to the voting committee but will not vote on inductees. 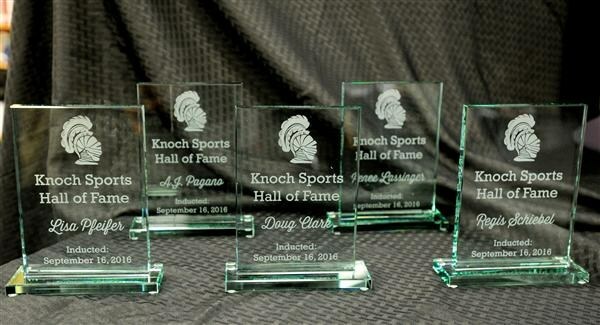 (5) Plaques of inductees will be displayed in the Knoch High School Athletic Wing. (6) Hall of Fame committee member changes will be voted on by remaining members. Nominees may be presented by Committee Members or by individual application to the Athletic Director.